Kobelco has unveiled seven new mini-excavators below 3tonnes at INTERMAT 2015 in Paris as a result of a major agreement with construction equipment manufacturer Yanmar. The deal increases the options for Kobelco customers and potential customers who work in extremely tight enents. 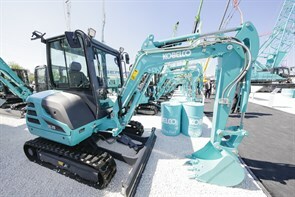 “INTERMAT is our first announcement and roll out of these models,” said Sander Gesink, Kobelco’s brand marketing manager.​“For us the key is having additional traditional long-radius mini-excavators where the counterweight is to the rear of the machine, outside the track length,” he went on. “Kobelco is well known for its short radius mini-excavators where the counterweight is totally within the length of the tracks and the cab rotates within the track length and width. Because of the zero tail swing on the SK10SR-3, SK17SR-5 and SK25SR-6, these machines are excellent for narrow environments.” Meanwhile, the traditional, or conventional, machines - SK16, SK18, SK22 and SK26 - have a higher lifting capacity because of the longer distance between load and rear counterbalance which makes it more stable than small radius machines. You can operate heavier buckets and lift more soil. But these conventional machines are equally at home on major sites where exceptional digging and lifting power is required, especially within the 1.7tonne and 2.7tonne classes. Another feature is a retractable crawler system on the short range 10SR-3 and 17SR-5. This driver-cab operated system gives a larger foot-print for additional working stability on loose terrain. A fully opening engine bay door ensures ease of maintenance. Also, the new dozer blade design on the 10SR-3 and 7SR-5 features a cutting edge. Availability of all seven models is expected by the third quarter of this year.